I made a couple of clean and simple kraft-cards with Simon Says Stamp's hexagon die. I paperpieced the hexagons with Prima's Engraver and Craftsman -papers and stamped "gratulerer" with Lawn Fawn's Harold's ABCs -alphabet set. Muutama clean and simple -tyylin kraft-kortti, joissa käytin Simon Says Stampin kuusikulmio-stanssia. Stanssasin palat myös Priman Engraver ja Craftsman -paperilehtiöistä ja "gratulerer" teksti on Lawn Fawnin Harold's ABC -aakkossetillä leimattu. 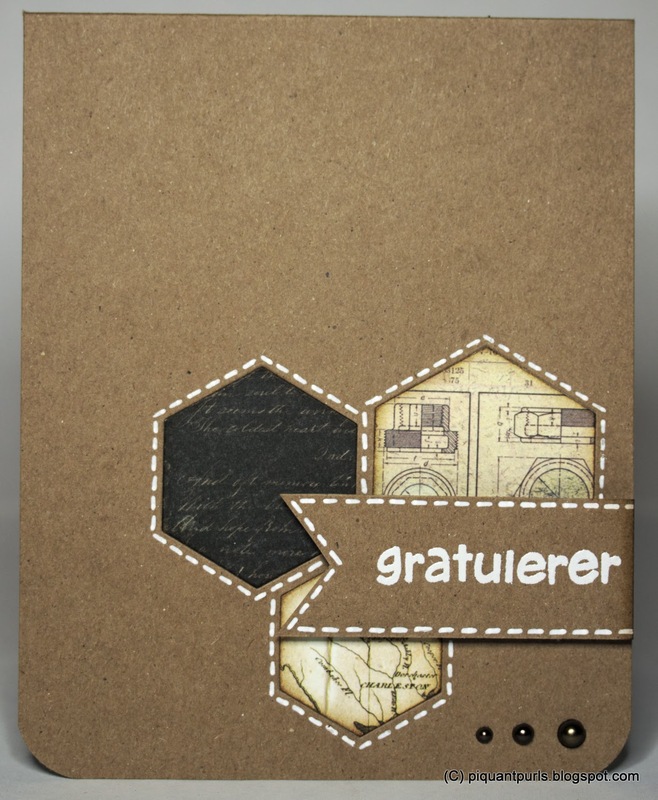 Inkssentials - Kraft Cardstock 12x12"
Vapailla tuli tikuteltua äänikirjojen seurana pikaneule: hyväksi havaittu Shetland Triangle Lanitium ex Machinan bfl/silkki-sekoituksesta, joka on Villavyyhdin viime vuotisen Suuren suomalaisen neulekerhon erikoisväri. During the holiday vacation I did a quick knit while listening to some audiobooks. The good old Shetland Triangle from the Finnish indie dyer Lanitium ex Machina's bfl/silk-blend. The picture above shows the colors quite correctly, the lack of light makes taking pictures of purple absolutely impossible at this time of year. Pingoitussetti on kyllä ollut hintansa arvoinen hankinta! I have not regretted spending money on a set of blocking wires! 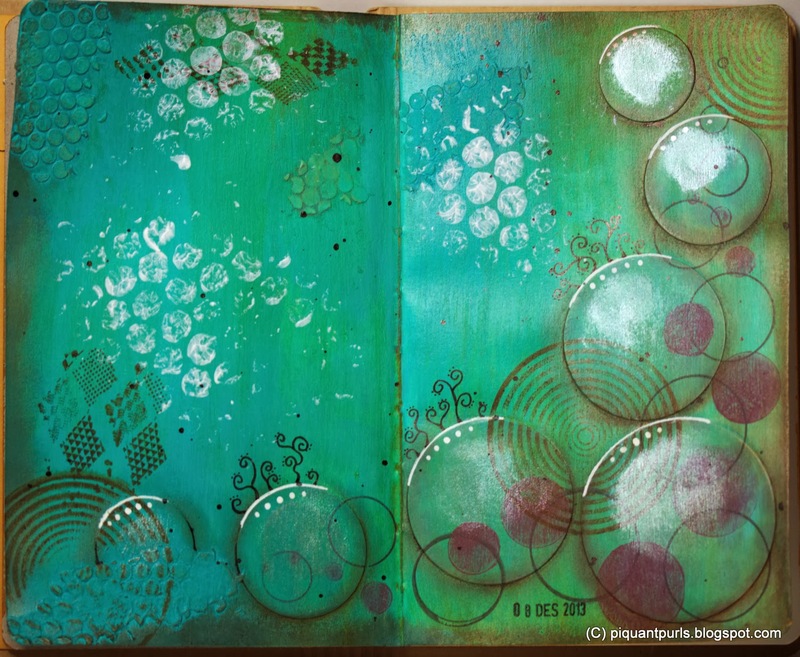 I've been gathering courage to start with art journaling, and here's my first spread in the smaller Dylusions journal. I definitely needed help starting out, so I got some books on Kindle. This is based on Sue Bleiweiss' The Sketchbook Challenge. 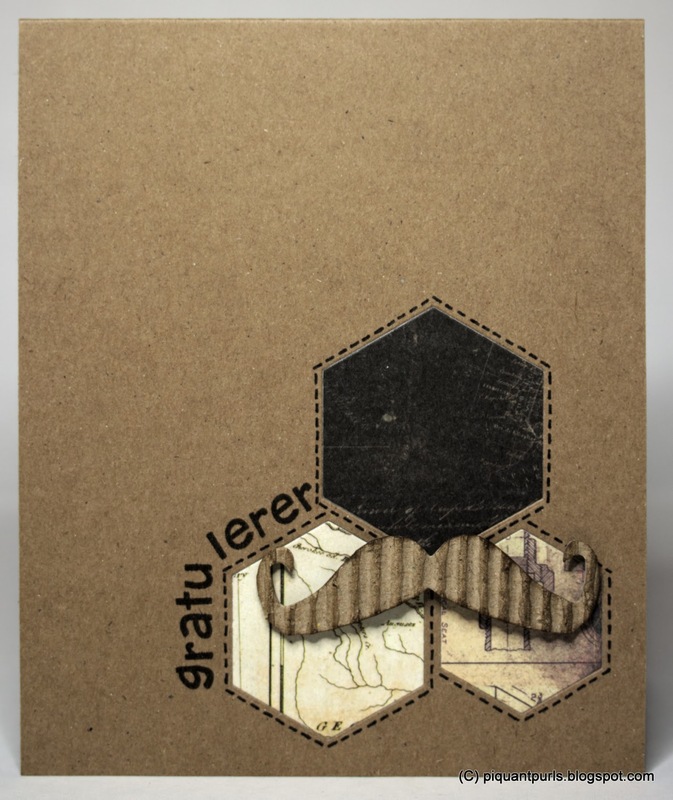 I'll also enter with this to the Simon Says Stamp Wednesday-challenge for "Make your own background". First I die cut some circle-shapes and glued them down with matte medium. The basecoat is teal acrylic paint, which I then coated with quinacridone nickel azo gold wash (yes yes, a total Donna Downey ripoff). 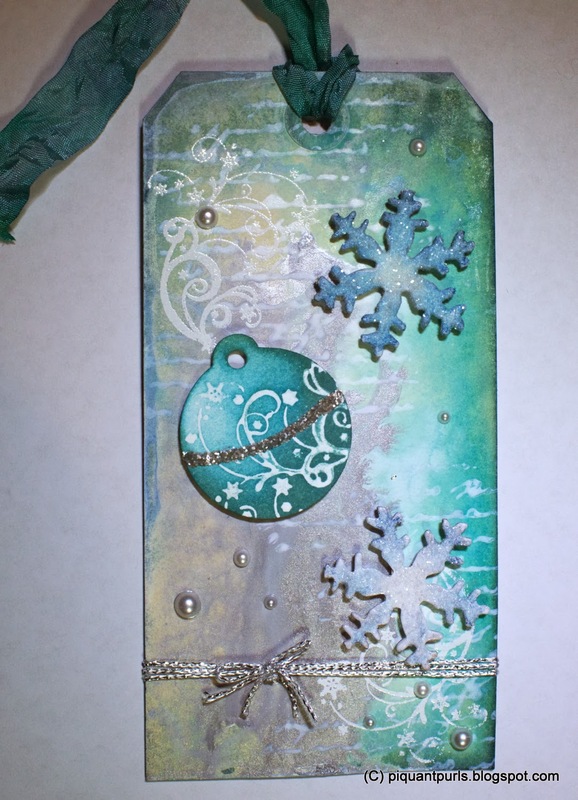 I added some stenciling with light modeling paste, and then realized it should've been under all the paint, so I had to paint it again with teal (live and learn). After that I used Simon Says Stamp Lots of dots - stamp set to stamp both the open circles with Archival in Watering can (great grey!) and the filled in circles with Distress Paint in Seedless Preserves. 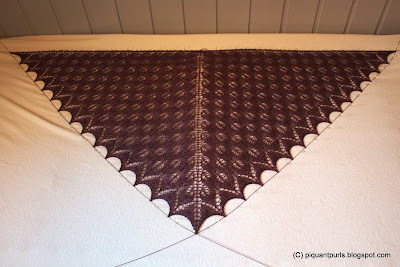 I used Unity's Layers of Life november 2013 kit in a couple of places too, in Archival sienna. 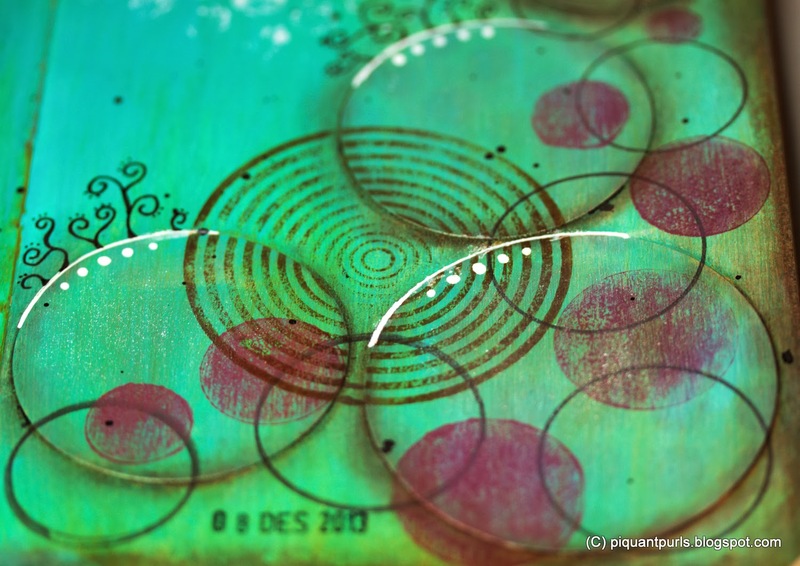 The shading around the diecut circles was made with different Big Brush pens, and the doodling with various black and white pens. When you compare this photo to the full spread, you don't see any of the big shiny (white) splotches on the diecuts. That is because of it being pearlescent acrylic I spead on the circles and it only catches light in certain angles. Stamped some gesso with bubble wrap and dripped some Dylusions in black marble on top.Shaded around the pages with some Big Brush too. I'm really happy with the right page, not so much with the left one. I got around to Mojo Monday as well this weekend. A very simple layered Christmas card with old stash. 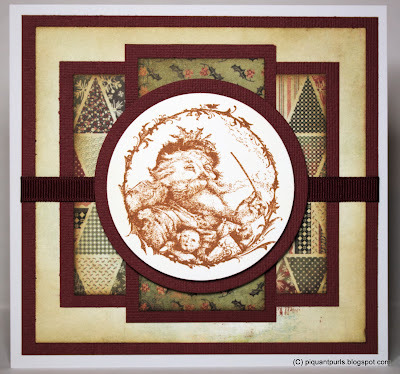 The papers are from Basic Gray's years old 6x6 pad Wassail and the stamp is from Crafty Secrets' Vintage Christmas. Simon Says Wednesday - Anything goes! 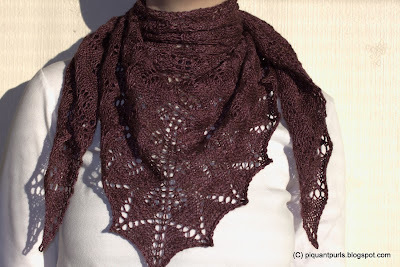 Simon Says Wednesday challenge calls for "Anything goes" for this round. 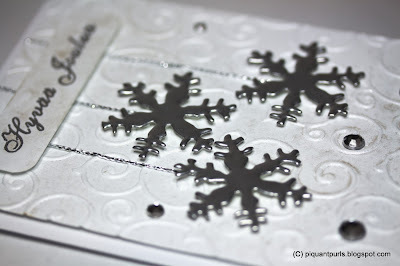 I finally got myself some proper silver embossing powder (ZING!) 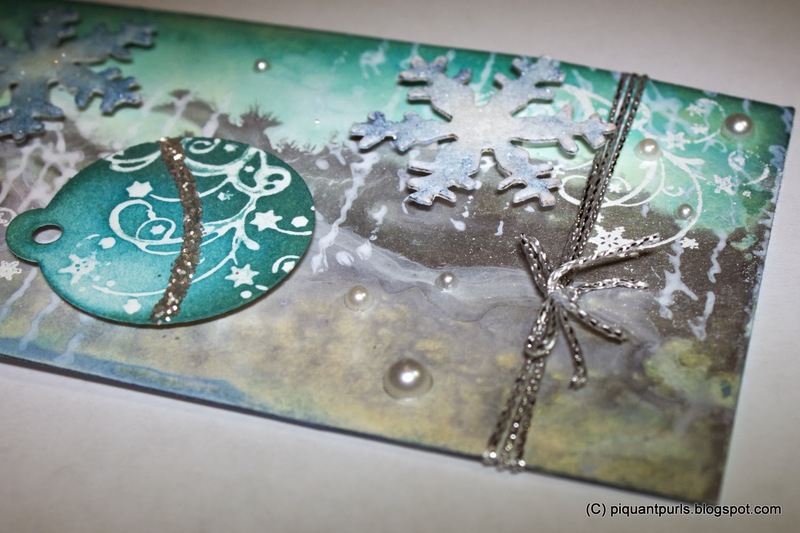 to try out heat embossing diecuts that I've seen around blogs / YouTube. 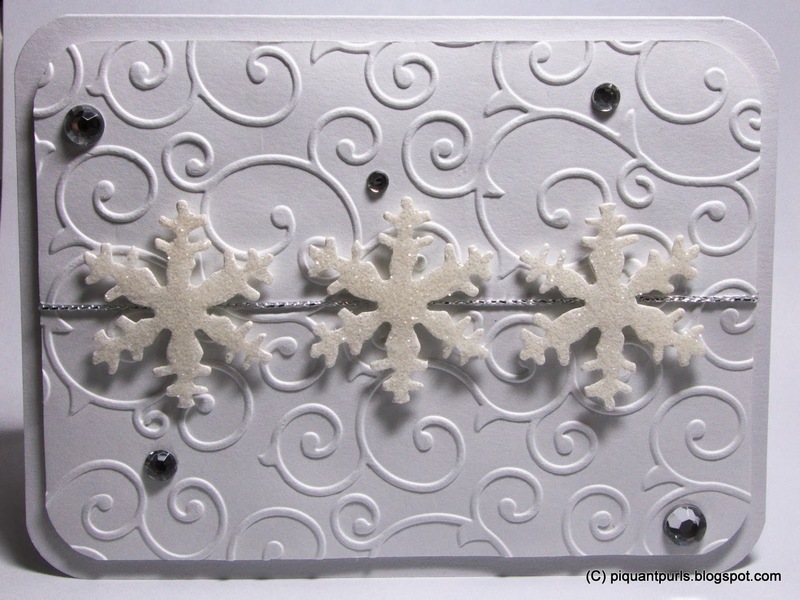 I diecut the Movers & Shapers snowflakes from heavy 300g mixed media paper, covered them in Versamark and in embossing powder, heated them, and repeated the process for a nice thick layer of silver. Loving it! The background looks a bit "dirty", but that's just Perfect Pearls mist which pooled on couple of spots. In real life it's nice and shiny. 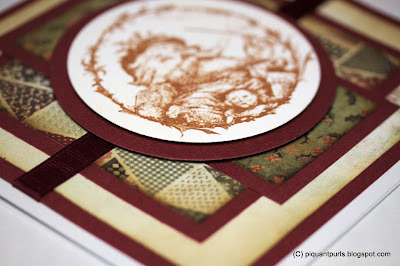 The dry embossing on the background is made with Couture Creations Intrinsic -folder. Simon Says keskiviikkohaasteessa on aihe vapaa. Ostin hopeanväristä kohokuviointijauhetta, jotta pääsin vihdoin kokeilemaan blogeissa / YouTubessa näkemääni stanssikuvioiden "metallisointia". Movers & Shapers lumihiutaleet saivat ensin kerroksen Versamarkia ja sitten ZING! :in hopeajauhetta, sulatus ja sen jälkeen toinen kerros päälle. Aivan mahtavan sileä lopputulos, tykkään! Kuvassa näyttää siltä kuin tausta olisi likainen, mutta suihkuttelin sen Perfect Pearlsin mistillä ja sitä kerääntyi joihinkin kohtiin niin, että se kameran kautta näyttää omituiselta. Taustan kohokuviointi on tehty Couture Creationsin Intrinsic -kohokuviointikansiolla. Paskiksessa oli reseptiä tarjolla, "5 timanttia + 3 lumihiutaletta + 1 naru" - tässä oma tulkintani. Tuohon alaosaan jätin tilaa jouluntoivotukselle, mutta totesin, ettei varastoistani löytynytkään sopivaa -yhtään-mitään. Kuvittelin omistaneeni hopeanväristä kohokuviointijauhetta, mutta ei. Ei ollut edes hopeanvärisiä tarroja (paitsi norjaksi, ja suunnittelin tästä Suomi-korttia). 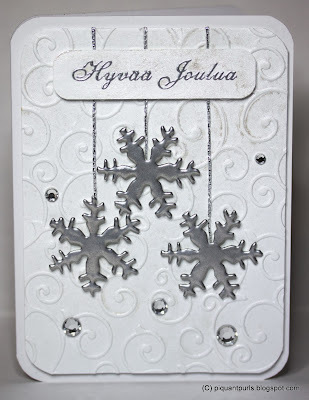 Lumihiutaleet ovat stanssattu paksusta 300 gm/m2 mixed-media paperista, päälle levitetty Glossy Accentia ja sitten kaadettu päälle Distress Clear Rock Candy -glitteriä. I'm not a big glitter fan, but some of the examples I've seen around YouTube and blogs made me go and grab Clear Rock Candy, Pumice Stone and Black Soot Distress Glitters. Not so very surprisingly October's theme was glitter in the 12 tags of 2013 October -challenge. 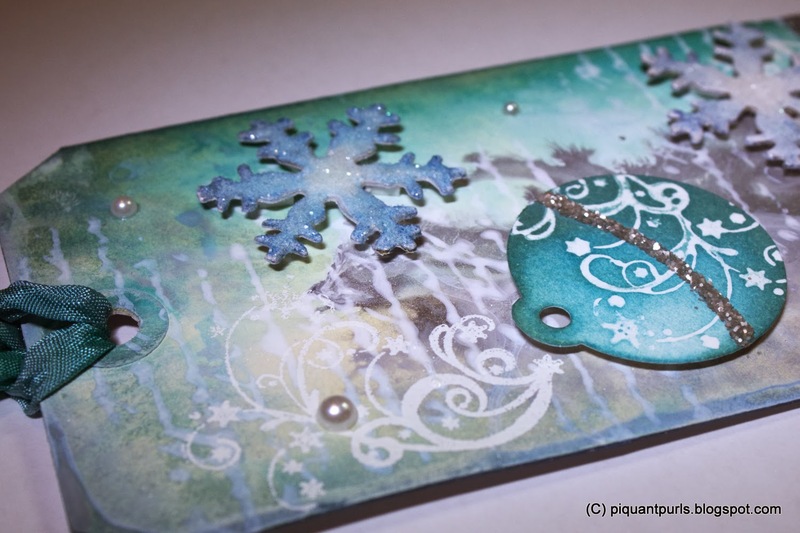 Since we don't do Halloween here in Scandinavia (or didn't, but the merchandise overload sure is getting heavier every year in the stores and I've seen kids trick-or-treating...), I made a winter/Christmas -themed tag. It's heavily themed like the one I did for a Finnish challenge, which I really liked. I must admit, I am falling more and more in love with Peacock Feathers as a color. 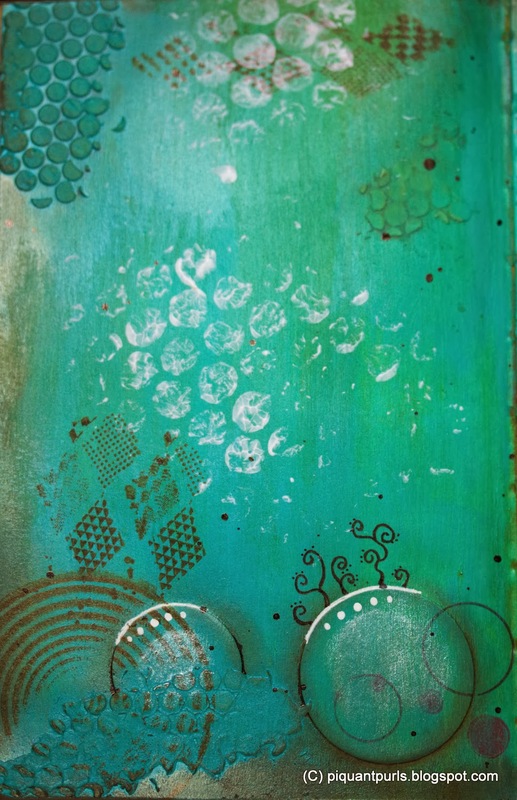 I only have it as a stain for now, which I used here for the background with Brushed Pewter and Picket Fence -paints. I shaded the edges with Faded Jeans and Pumice Stone and added some stamping in Picket Fence paint. 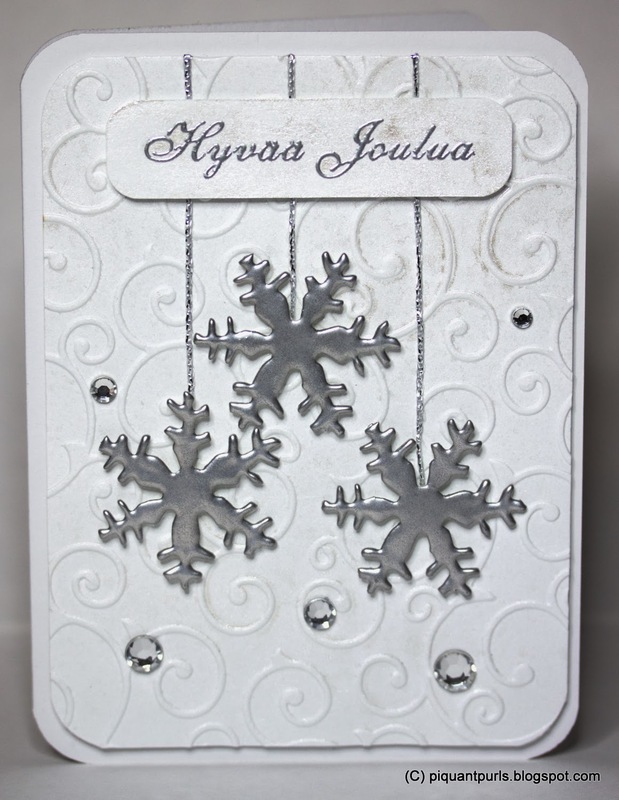 The swirls are heat embossed with Versamark and detailed white embossing powder. 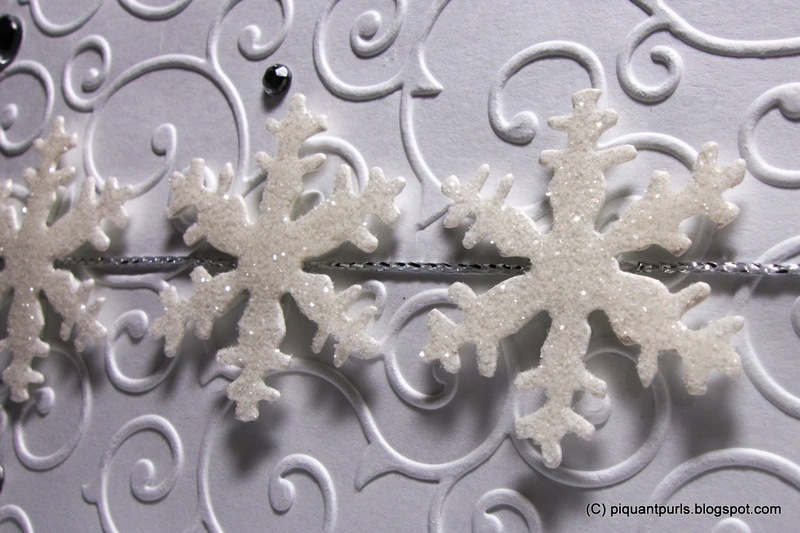 The snowflakes are cut from a food cartong and painted white with Picket Fence, then covered with Glossy Accents and Clear Rock Candy glitter. They are then shaded with Faded Jeans. The xmas-ball is a diecut with the Tiny Tabs and tags -Bigz die, stamped with Picket Fence and then colored with Peacock Feathers, Faded Jeans and Pumice Stone. Glitter is Pumice Stone. 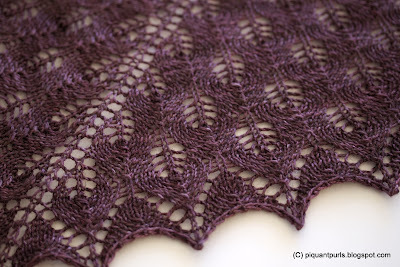 Added some half pearls and silver-colored yarn to finish the tag.